August was interesting. It brought death, storm destruction, unpleasant dental work and a diagnosis of asthma for the Ronnie James. It also brought much in the way of good times, a new home and a new job for Callaghan. At work, the fall semester started, and my Monday that week was epic: I started it first thing in the morning at home by spilling a full, large mug of coffee all over myself, the couch, the floor and the inside of my bag, which was sitting (open, of course) on the floor. How to start your day! Bathe in hot coffee! Such literal, caffeinated ablutions sanitize the early-morning mind. That’s how I saw it. Too bad about the almond milk, though. Coffee scent still wafts out of my bag every time I open it. It’s not a terrible thing. On that note, let’s start with entertainment! Netflix released the fourth and final season of The Killing on August first, and we greedily absorbed it all in two days. It’s over now, and we’re sad about that, but I’ll tell you what… rarely has the final episode of a series felt so satisfying. I think I’ve said this before, but it’s worth repeating: we’re hard-pressed to explain how The Killing’s Linden and Holder endeared themselves to us so completely. Our favorite aspect of watching the series was witnessing the development of these characters and their partnership over the arc of the four seasons, but in fact, we loved everything about it. We found the haunting crime drama to be intriguing and masterfully-paced. The city of Seattle was depicted as mostly rainy and gray, and it seemed to be cast as a character in and of itself to gorgeous effect, veiled more in lyricism than grunge. The actors’ performances were exceptional. The plotlines for each of the seasons kept us quietly on edge. We enjoyed seasons one, two and four the most, but each season built on the last while revolving around unique plotlines (with the exception of season two, which was part two of the opening season’s storyline). 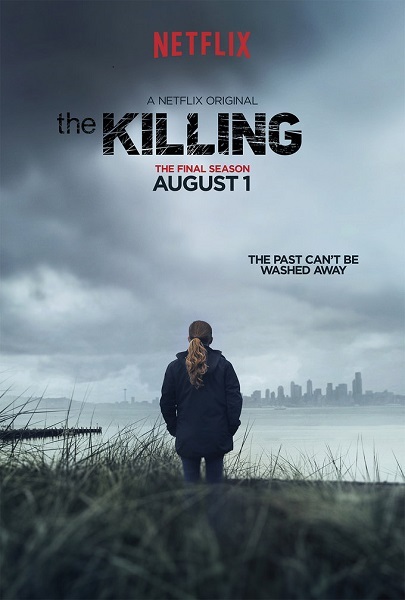 Overall, we would say that The Killing is a brilliant and underrated series. This brings to mind an incident that occurred in the store the other day: I was approached by a guy who wanted to know whether we had cable at home (evidently he worked for a cable company), and when I said no, he asked why not. I answered, “Because Netflix.” He was annoyed (maybe because I laughed, which was probably rude, now that I think about it) and pretty much stalked away with a black cloud over his head. At least we didn’t upset him more by telling him about the other internet resources we use for watching all kinds of movies and T.V. series! 2). Rage in the Cage (August 9, 2014). 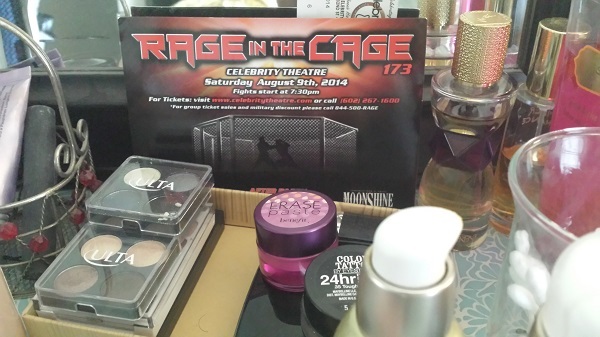 Rage in the Cage at the Celebrity Theatre was good times! 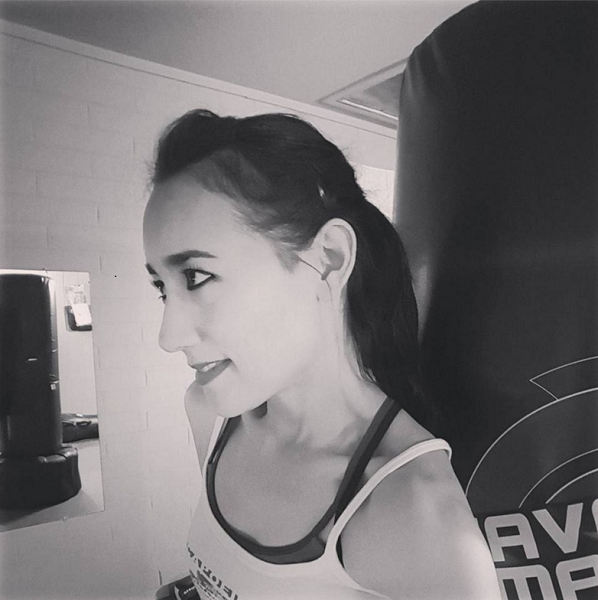 It’d been too long since I’d attended a combat sports event at the Celebrity Theatre, so when our friend and Body Combat instructor said that she could get us a good deal on tickets because she was going to be working the event as a ring card girl, we gladly seized the opportunity. Not only was it fun to see Izzy at the event (it was like a preview of her participation in the natural physique competition she ended up dominating at the end of the month! ), but the fights provided rock-solid entertainment. It was awesome to see that two of the night’s winners hailed from Arizona Combat Sports, the gym where I’d trained in Muay Thai back in its earlier days. The next Rage in the Cage event is in October, and we’re looking forward to it! The white peaches have been so good, we haven’t been able to get enough. We devoured white peaches all month… the ones at our favorite Fry’s were fabulous (maybe they still are), and we couldn’t get enough of them! You know how it is when you bite deeply into a piece of fruit and it’s just so satisfying on every level? It’s like that with these peaches. They’re sweet, fragrant, juicy and dense. 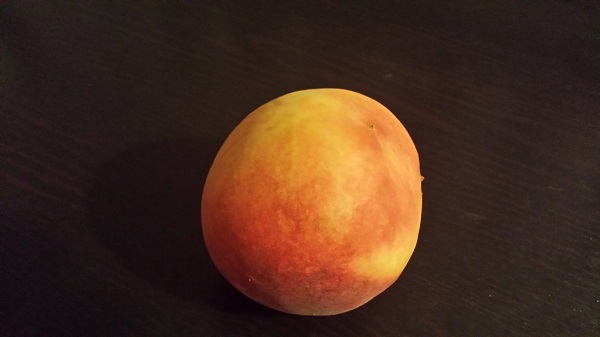 For me, nothing signals or defines summer as convincingly as certain stone fruits – peaches, cherries, apricots and plums. 4). 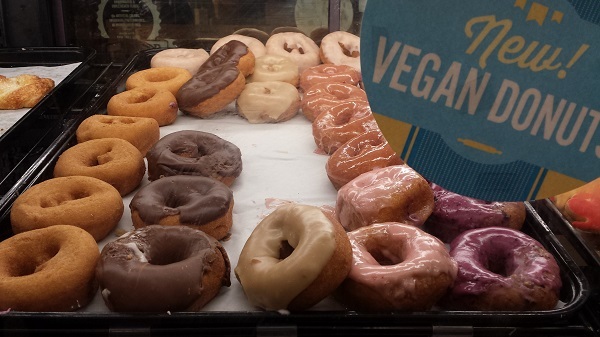 Vegan donuts at Whole Foods. Why?! And why do they have to be so good? Leave it to our favorite Whole Paycheck Foods store to start stocking their bakery with vegan donuts. There’s nothing healthy about these deep fried, refined carb- and sugar-loaded delectables; “vegan” isn’t necessarily synonymous with “healthy,” and treats like these donuts are a great case in point. I feel a bit sheepish admitting that I’ve eaten something like five of them since I discovered them just a few weeks ago. Now I need to develop a will power specific to these donuts. Or not. 5). Little Ranch House in the Desert. We’ve been in our new house for two days, and we all love it! 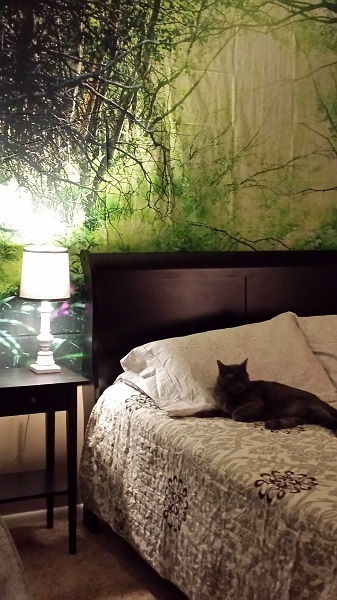 We feel like we’re home, and all the space is a wonderful novelty for the kitties. We adopted them from a small apartment in France, and they’ve lived in nothing but equally small spaces up until this move. It’s been funny watching them here… it’s like, they have so much space, they don’t know where to go first. The bed is still their headquarters of choice, though. Day One in the new house: Ronnie James purring in contentment on our bed. 6). 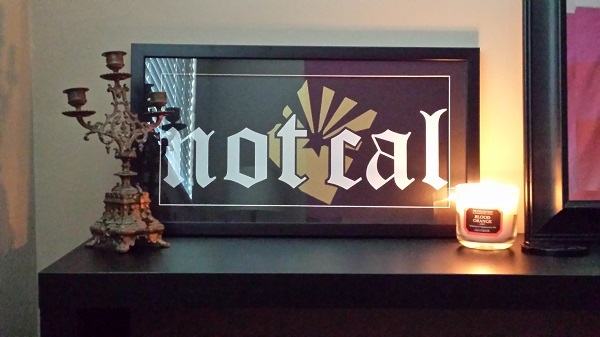 Framed “Not Cal” decal. NOT CAL in a frame! I finally got this second NOT CAL decal framed! I put it in my new home office, of course. I love it. 7). 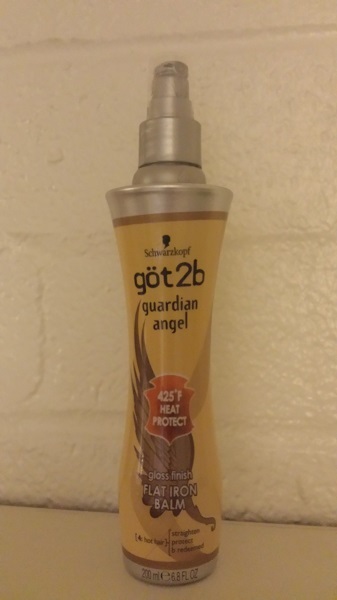 göt2b Guardian Angel Gloss Finish Flat Iron Balm. The hair product that guards against heat even when you don’t use heat. This is good stuff. I picked this up in August thinking that I would start using my straight-iron again, but I discovered that I like what it does just by itself, as a leave-in treatment on dry hair. It adds a little something (I don’t even know what, really) that I like to my hair. Manifesto, the way to end the summer. 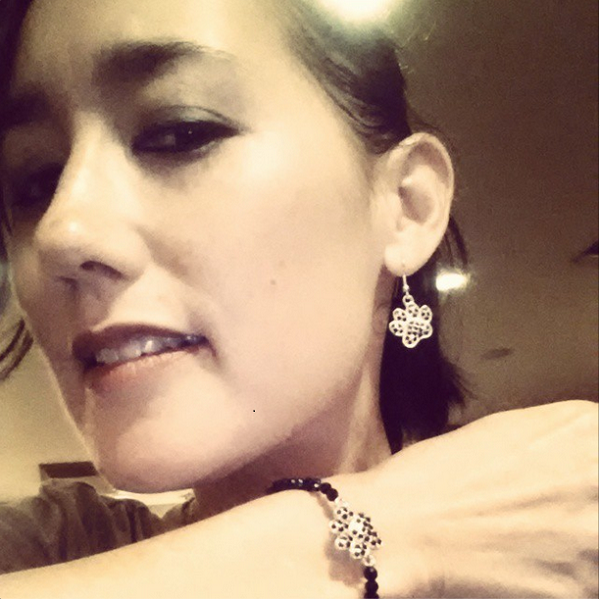 In August, I started wearing “Manifesto,” which caught my eye because of its name. It amused me because of the Unibomber. (Not that I in any way condone, support or agree with the Unibomber and his activities, mind you. Just… you know. Manifesto.) Then, of course, there was the fragrance, itself! 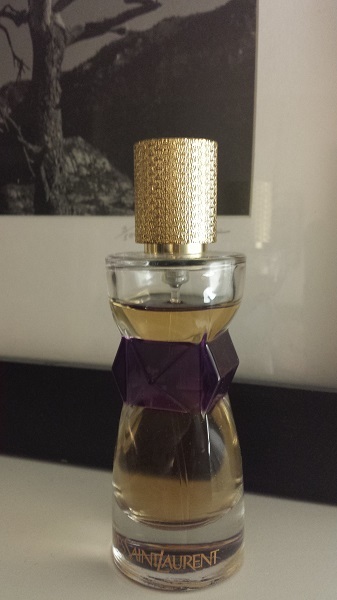 Made by Yves St. Laurent, it’s lovely with its body of white flowers, woods and vanilla. I think it bridges the summer and fall gorgeously. We were on an errand at Michael’s when I saw this cheap little set of costume jewelry. Paws. They were near a Halloween-themed display, so they may have been a part of that, which would make sense… I’m more prone to impulse-buying when Halloween things are out than any other time of the year. This brings us to Ronnie James’ and Nounours’ “Favorites” pick for August! 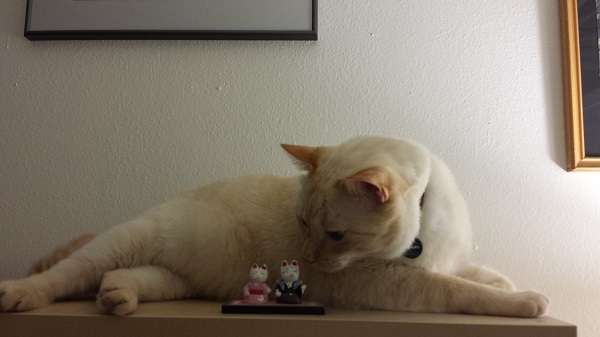 A Feliway’d Nounours on the eve of our move. That wraps up my “little things” favorites list for August. Welcome, September!